"He was a very dynamic person on the instrument, and I liked that, the way he approached it, you know. I was inspired a lot by Bud." 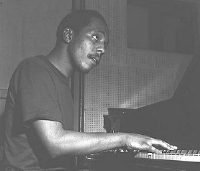 From 1940 Bud Powell took part in informal jam sessions at Minton's Playhouse, New York, where he came under the tutelage and protection of Thelonious Monk and contributed to the emerging bop style. By 1942--44, when he played in the band of his guardian Cootie Williams, he had already developed his individual style in most of its essentials. After sustaining a head injury during a racial incident in 1945, he suffered the first of many nervous collapses, which were to confine him to sanatoriums for much of his adult life. Thereafter, in the late 1940s and early 1950s, he appeared intermittently in New York clubs with leading bop musicians or in his own trio. From the mid-1950s, as his mental health and musical powers deteriorated, he gradually restricted his public appearances. He moved in 1959 to Paris, where he led a trio (1959--62) with Kenny Clarke, the third member of which was usually Pierre Michelot, and enjoyed a certain celebrity status. After returning to the USA in August 1964, he made a disastrous appearance at Carnegie Hall (1965), and soon was obliged to abandon music altogether. Powell was the most important pianist in the early bop style, and his innovations transformed the jazz pianism of his time. A prodigious technician, he was able at will to reproduce the demanding styles of Art Tatum and Teddy Wilson, echoes of which can sometimes be heard in his ballad performances. At fast and medium tempos, however, he preferred the spare manner that he devised in the early 1940s: rapid melodic lines in the right hand punctuated by irregularly spaced, dissonant chords in the left. This almost antipianistic style (which was adopted by most bop pianists of the time) left him free to pursue linear melody in the manner of bop wind players, and it was as a melodist that Powell stood apart from his many imitators. At its best, Powell's playing was sustained by a free unfolding of rapid and unpredictable melodic invention, to which he brought a brittle, precise touch and great creative intensity. Except in his later years, when his virtuosity flagged and he selfconsciously adopted a primitivism resembling Monk's, Powell never altered this basic approach, but worked ceaselessly within it to devise new melodic ideas, harmonies, and ways of coupling the hands. He greatly extended the range of jazz harmony by reducing his chordal underpinning to compounds of 2nds and 7ths, and achieved an extraordinary variety in his phrase lengths, which range from brief flurries to seemingly inexhaustible lines that ignore the structure of the original. Although most at ease in a trio setting, Powell was stimulated to his best work in competition with other leading bop soloists such as Charlie Parker, Dizzy Gillespie, J.J. Johnson, Sonny Stitt, and especially Fats Navarro. Powell also composed a number of excellent jazz tines, among them "Un Poco Loco," "Dance Of The Infidels," "Tempus Fugit," and "Bouncing With Bud," as well as the remarkable "The Glass Enclosure," a musical impression of his experiences in mental asylums, which points to a talent for composition that was unfortunately left undeveloped. A selected discography of Bud Powell albums. The Bud Powell Trio, 1949-51, Verve. The Amazing Bud Powell, Vol. 1, 1949-51, Blue Note. The Amazing Bud Powell, Vol. 2, 1951-53, Blue Note. Bud Plays Bird, 1957, Roulette. The Scene Changes, 1958, Blue Note. Tribute To Cannonball, 1961, Columbia. A Portrait Of Thelonious, 1961, Columbia. Bouncing With Bud, 1962, Delmark.